Ravenglass is a small coastal village and natural harbour in Cumbria, England roughly halfway between Barrow-in-Furness and Whitehaven. Historically in Cumberland, it is the only coastal town in the Lake District National Park. It is located at the estuary of three rivers: the Esk, Mite and Irt. The town dates back to at least the 2nd century, when it was an important naval base for the Romans. The Latin name of the settlement is the subject of scholarly debate: believed by some experts to have been Tunnocellum, it is often named Glannoventa. It occupied the most southerly point of the Cumbrian coastal defence system, which can be seen as an extension of Hadrian's Wall and the western extremity of the Roman frontier World Heritage Site. Ravenglass was occupied by the Romans for over 300 years and had a Roman garrison (castra) of 500 soldiers. 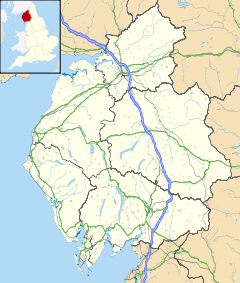 The town was a regional supply point for much of north-western Roman Britain, with a road from Ravenglass over the Hardknott Pass to the Roman forts at Hardknott and Ambleside. The location is featured in The Fort at River's Bend, a book in Jack Whyte's A Dream of Eagles (Camulod Chronicles) series, and is also mentioned briefly in Mary Stewart's Merlin trilogy under the name Clannoventa. Today, there are few Roman remains, with the notable exception of a bath house, known locally as Walls Castle. This is one of the largest remaining Roman structures in England, originally covering an estimated area of 30 yards (27 m) by 13 yards (12 m) and with walls up to 12 feet (3.7 m) high, though only one end is now visible. Excavations of the rest of the foundations have since been covered and are not visible. The property is now maintained by English Heritage. Approximately a mile's walk from the bath house is Muncaster Castle, which it is believed was built partly with the remains of a Roman fort which was located near Ravenglass. The grade II listed Muncaster War Memorial, designed by Edwin Lutyens, sits between Muncaster and Ravensglass. 'Renglas' appears in charters and other records of the late 12th century. In 1208 King John granted Richard de Lucy, Earl of Egremont a charter for a market at Ravenglass on Saturdays and a yearly fair on the festival of St. James, 5 August. There are multiple explanations of the origin of the name Ravenglass. One is that it may be derived from, or from words equivalent to Welsh yr afon glas, meaning "the greenish or blueish river". The name may also be of Norse-Irish origin, containing the Irish personal name Glas and meaning "Glas's part or share". The terminal element might be Gaelic glas, "small stream". Also suggested is derivation from the Old Norse personal name Hrafnkell, suffixed with Old Norse óss, "estuary". ^ "RAVENGLASS (Itunocelum)". Archived from the original on October 29, 2013. Retrieved February 26, 2013. ^ Historic England. "Muncaster War Memorial and area wall (1086636)". National Heritage List for England. Retrieved 7 September 2016. ^ "St Patrick – the Welsh Speaker". ^ "The place-names of England and Wales". Retrieved 17 July 2017. ^ a b Millward, Roy; Robinson, Adrian Henry Adrian Wardle (1972). Cumbria - Part 2 - Volume 5 of Landscapes of Britain. MacMillan. p. 38. Retrieved 12 January 2019. ^ a b Sedgefield, W J (1915). The Place-Names of Cumberland and Westmorland. Manchester University Press. p. 14. Retrieved 12 January 2019. Wikimedia Commons has media related to Ravenglass.